VANCOUVER, BRITISH COLUMBIA--(Marketwired - April 20, 2015) - Forum Uranium Corp. (TSX VENTURE:FDC) ("Forum" or the "Company") is pleased to announce the results of a 10-hole 2,453 metre drill program on Forum's 100% owned Fir Island project located on the north rim of the Athabasca Basin. In total, five targets were tested with the last five holes (FI-6 to 10) focused on the East Channel Zone where spectacular alteration within sandstones overlying a major structural lineament was encountered (Figure 1). For drill core photos, visit http://www.forumuranium.com/s/Uranium-PhotoGallery.asp. Samples have been sent to the Saskatchewan Research Council for geochemical analysis and the results should be available in a month. Ken Wheatley, Vice President, Exploration stated, "Dravite and sudoite clay alteration, quartz dissolution and remobilization, and sulphides deposited well up into the sandstone column are all key components of a robust and nearby source of uranium mineralization. We wanted to continue with the drill program, but spring had arrived and the ice was on its way out. Given that this property has never been drilled, this program is a definite success in defining a new, large prospective trend within the Athabasca Basin." 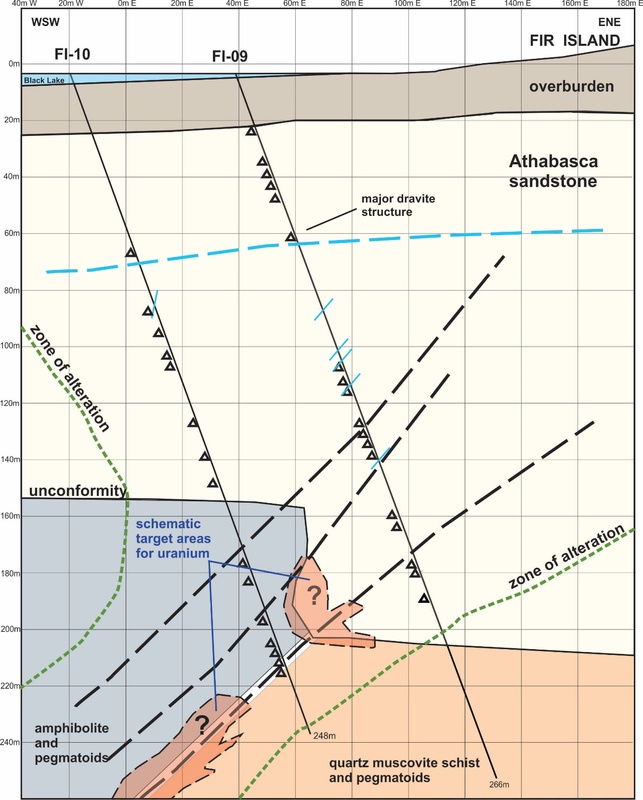 The East Channel target (EM, gravity, topography and airborne magnetics) exhibits a 50m down-drop of the sandstones - 150m deep on the west side of the structure and 200m deep on the east side (Figure 2). Two fences were completed on this target, a three-hole fence followed by a two-hole fence 50m to the south. The final hole intersected the fault in the underlying basement lithologies, a several metre wide zone of intense alteration (including secondary hematite) and shearing with sections of missing core. Strong alteration on the upper-west side of the fault was noted for at least 40m, and a difference of lithologies on either side of the fault confirmed that there has been significant movement over its lifespan. This last hole into the zone was abandoned at 248 metres due to spring break-up. The East Channel Structure can be traced by airborne magnetics for approximately 18km on the Fir Island project. The two drill fences tested only 50 metres strike length of this structure. 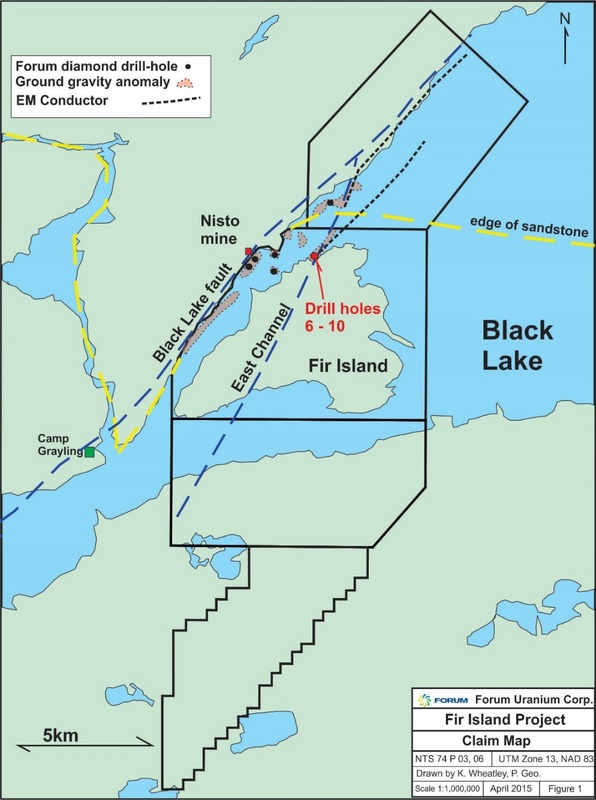 The parallel Black Lake structure, located 1.5km to the west, can be traced for at least 200km across the entire Athabasca Basin and is associated with Cameco's Centennial deposit (up to 33.9m averaging 8.78% U3O8 as reported on the Formation Metals website). This structural corridor was important for concentrating fluid flow during the basin-wide uranium mineralization event, similar to the Mudjatic/Wollaston boundary that strongly influenced the deposits of the eastern Athabasca. This property has year-round road access. Supplies and fuel are readily available at the nearby communities of Stony Rapids and Black Lake. To view "Figure 1: Map of the Fir Island Project" please visit the following link: http://media3.marketwire.com/docs/Fir_Island_Project_Map.jpg. Claims are outlined in black. Both the Black Lake fault and the East Channel are wide structural zones. The Black Lake fault has numerous uranium showings along it, but the East Channel has been untested to date. Ken Wheatley, P.Geo., Forum's Vice-President, Exploration is the Qualified Person that has reviewed and approved the contents of this news release.